BUENOS AIRES (Reuters) - China and the United States have agreed to halt additional tariffs as both nations engage in new trade negotiations with the goal of reaching an agreement within 90 days, the White House said on Saturday after President Donald Trump and Chinese President Xi Jinping held high-stakes talks in Argentina. Trump agreed not to boost tariffs on $200 billion of Chinese goods to 25 percent on Jan. 1 as previously announced, while Beijing agreed to buy an unspecified but "very substantial" amount of agricultural, energy, industrial and other products, the White House said in a statement. China "is open to approving the previously unapproved" deal for U.S. company Qualcomm Inc <QCOM.O> to acquire Netherlands-based NXP Semiconductors <NXPI.O> "should it again be presented." In July, Qualcomm - world's biggest smartphone-chip maker - walked away from a $44 billion deal to buy NXP Semiconductors after failing to secure Chinese regulatory approval, becoming a high-profile victim of the Sino-U.S. trade dispute. 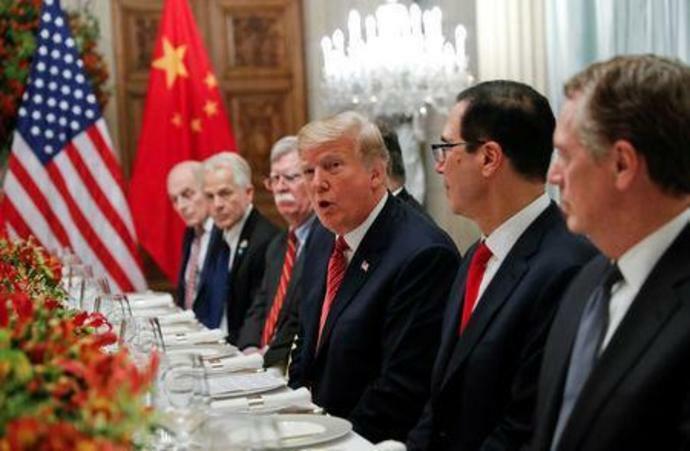 The White House said that if agreement on trade issues including technology transfer, intellectual property, non-tariff barriers, cyber theft and agriculture has not been reached with China in 90 days that both parties agree that the 10 percent tariffs will be raised to 25 percent. Trump slapped 10 percent tariffs on $200 billion in Chinese goods in September. China responded by imposing its own round of tariffs. Trump has also threatened to add tariffs on another $267 billion of Chinese imports. Xi agreed to designate the drug fentanyl as a controlled substance, the White House said. For more than a year, Trump has raised concerns about the synthetic opioid being sent from China to the United States, which is facing an epidemic of opioid-related deaths. China also agreed to start purchasing agricultural products from U.S. farmers immediately, the White House said. U.S. companies and consumers are bearing part of the cost of the U.S. tariffs on China by paying higher prices for goods, and many companies have hiked prices on imported goods. At the same time, U.S. farmers have been hurt by reduced Chinese imports of soybeans and other products.